We love to create evocative wedding portraits of the bride and groom at night. While most wedding photos take place during daylight hours, images taken at night can be some of the most dramatic and different images from the wedding. The importance of understanding and using lighting effectively cannot be understated when it comes to creating images at night. There are many techniques we may use. Sometimes, a constant light held by an assistant is the best option to softly light the couple. We may use a LED light or video light that have controls to adjust for brightness and temperature. We may also use off-camera flash behind the couple to backlight them or create a silhouette. An off-camera flash set on a stand with a modifier to soften and diffuse the light is another technique to use off-camera flash. Other night time photo techniques we may use when doing wedding portraits after the sun goes down includes using long exposures or doing light painting. For this night portrait at the prestigious Pelican Hill Resort at Pelican Hill in Newport, California, we used a constant video light to light to the couple and an off-camera flash on a tripod behind them to backlight. This separated the couple from the background. 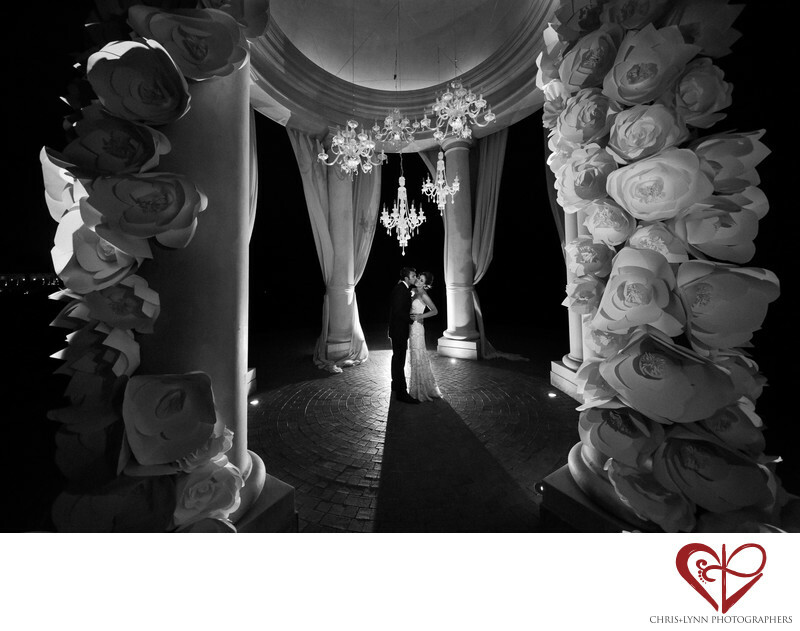 The chandeliers and floor potlights also added some ambient light to further add interest to this night wedding photo. 1/25; f/4.5; ISO 3200; 12.0 mm.